It’s the dead of winter. You’ve dealt with cold and snow for the last few weeks and the forecast predicts more in the very near future. Break up the monotony of winter with dreams of summer parties and the endless ways you can dress up your home with a new awning. Once you choose a general direction, you’ll have to consider colors, fabrics, patterns and styles. Simplify your awning style choice with a few tips. What purpose do you want your awning to serve? This question should be the first thing you ask yourself. 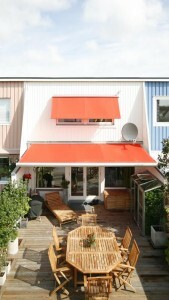 If you simply want your awning to serve a functional purpose, color and pattern will be less important than shape. On the other hand, you may want your new awning to stand out and add visual interest to your home. In this case, the look of your awning will need to take center stage. Color. When you simply want your awning to add some shade and class to your home, you may want to choose simple designs with colors that blend with the overall look of your home. Neutral shades can be a great way to go. Choosing accent colors like that of your trim and doors can help your awning become an extension of your homes carefully thought out design. Perhaps you’re looking for a pop of color in a drab back yard. Consider the area surrounding your home. If your back yard is heavily wooded, earthy tones might be a good option. There is a color out there for every awning need. Style. As you browse through the different awning styles out there, consider both functionality and design. A marriage of these two principles will showcase your personality, while helping you create the best outdoor space for your lifestyle. Shed awnings are one of the most effective in creating shade, quarter round awnings help repel rainwater, and A-frame awnings create a professional look. Extras. You can perk up a very functional style with valance appliqués and trims. There are many neat patterns to choose from. Some are elaborate, some are whimsical and some are simple. Determine what sort of image you want to project with your awning and pick the one that best matches. You can even get these add-ons in different hues to add an extra level of personality.